Another high school friend and I went to eat at Jeon Ju Hyang on the first Friday of August. Another friend had recommended this restaurant to me. 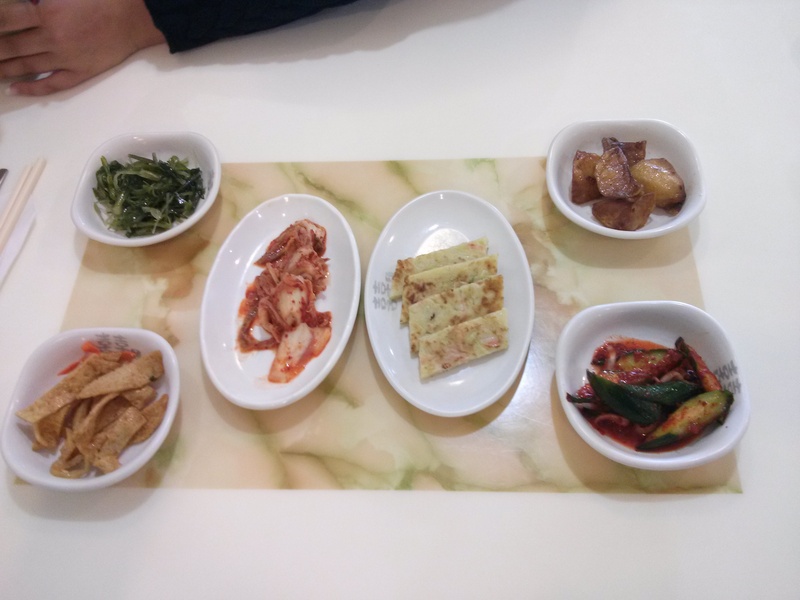 Jeon Ju Hyang has a good selection of kimchi compared to other Korean restaurants however it doesn’t have the large variety available at Oh Geul Boh Geul. 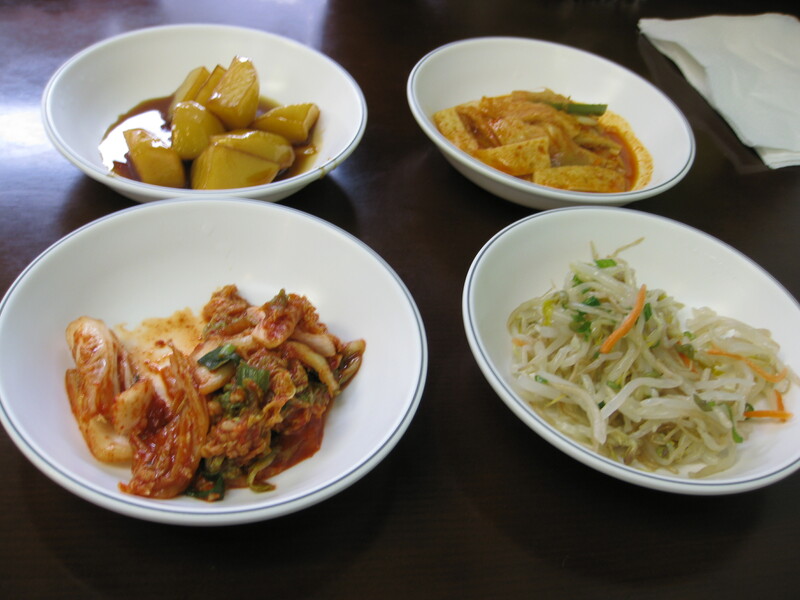 I equally liked all of their kimchi dishes although my friend preferred the non-spicy kimchi dishes. My friend and I both ordered the Pork Galbi ($10.99). It comes with a bowl of rice and miso soup. Pork galbi is marinated pork ribs. 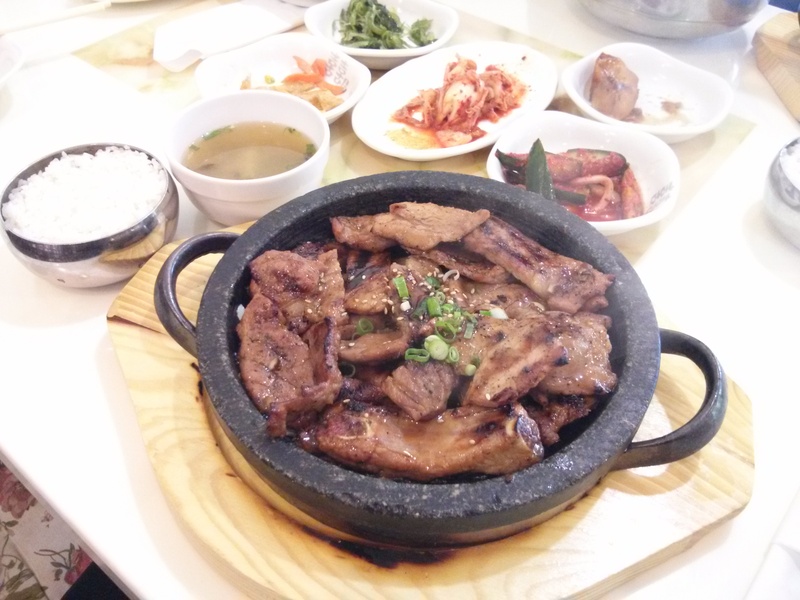 The pork galbi is on a sizzling hot plate. It was quite savoury. I really enjoyed it. 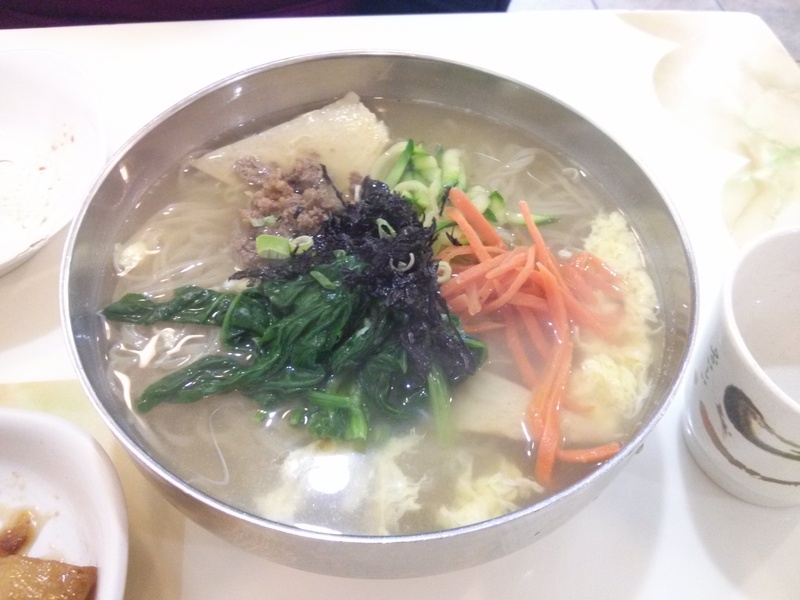 My friend also had the Jan Chi Guksu ($7.99). 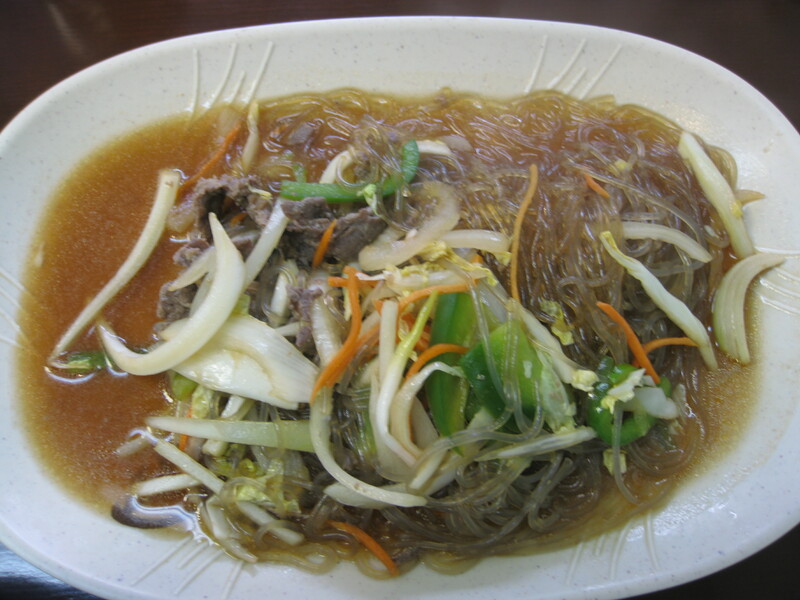 Jan Chi Guksu is Korean noodles with chicken soup, beef, zucchini, egg, seaweed and carrot. My friend absolutely loved it. She said that it tasted very delicious. Overall, if you’re in Scarborough and wanting to eat Korean cuisine then I recommend this restaurant. My friend and I were in downtown Kitchener to let my friend try bahn mi however the restaurant we were looking for moved locations so we were left wandering around downtown Kitchener looking for a decently priced Asian restaurant back in early April. We came across Korean BBQ and decided to try it. 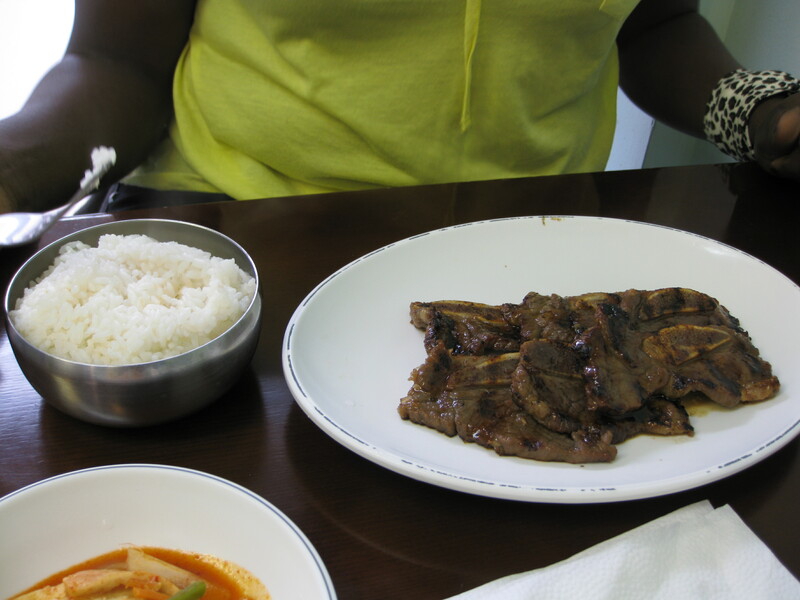 My friend got kalbi with rice and bulgogi with rice (both are $8.49 each) because she couldn’t decide between the two. I got sweet potato noodles ($8.49). They gave us 4 different kinds of kimchi. There was potatoes, kimchi, beansprouts and spicy beancurd. The kimchi was good. The sweet potato noodles were ok. My friend liked both the kalbi with rice and bulgogi with rice. 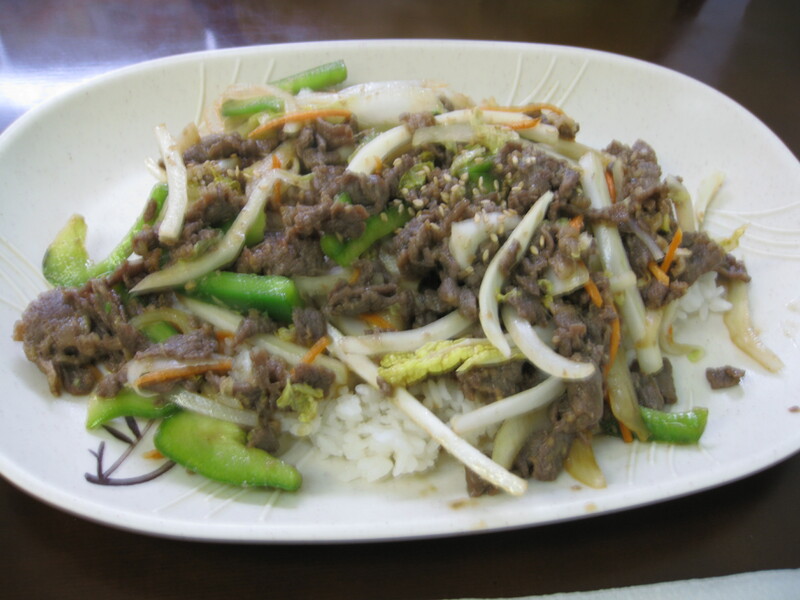 If you don’t want to go to Owl of Minerva at Uptown Waterloo and you’re in Kitchener, this restaurant serves decent Korean food.